This is by far the most popular section on this website and has had over 2,500 visits. I'm really interested to know who looks at these pages so if you feel like it drop me a line at my Contact page. Living in an impoverished township is the shocking reality faced by the vast majority of South Africa's urban black and coloured communities. 'Informal settlements in the nine major cities of South Africa have grown from about 300 in 1994 to more than 2,700 currently, housing approximately 1.2 million households (growing at 2 – 6% per annum across different councils) [as at 2010.] See WVP Fieuw. In the Western Cape, Cape Town is the hub around which these townships have been created - first under colonial administrations and then under Apartheid. But they exist not only on the great exposed, barren, sandy plains of the Cape Flats - with its flood and fire risks - but also on the Cape Peninsula and outside every Western Cape town with any need for cheap seasonal or permanent labour. Twenty years after the end of Apartheid township life continues to be the way of life for most urban South Africans. There have been material improvements in terms of access to housing, sanitation, water, electricity, social services, education and welfare grants but overall levels of inequality have hardly been touched making South Africa the second most unequal country in the world. And levels of relative and absolute poverty - and their attendant levels of crime, disease (HIV/AIDS and TB), unemployment and life expectancy - remain absolutely shocking. I have organised this section of the website so that it gives voice first to people living in the townships. I have never been to a township and I can only guess at the daily and particular reality of living in one. Zakes Mda's moving novel, Ways of Dying (2002), set in the Cape townships is one way to get a sense of what it might be like. 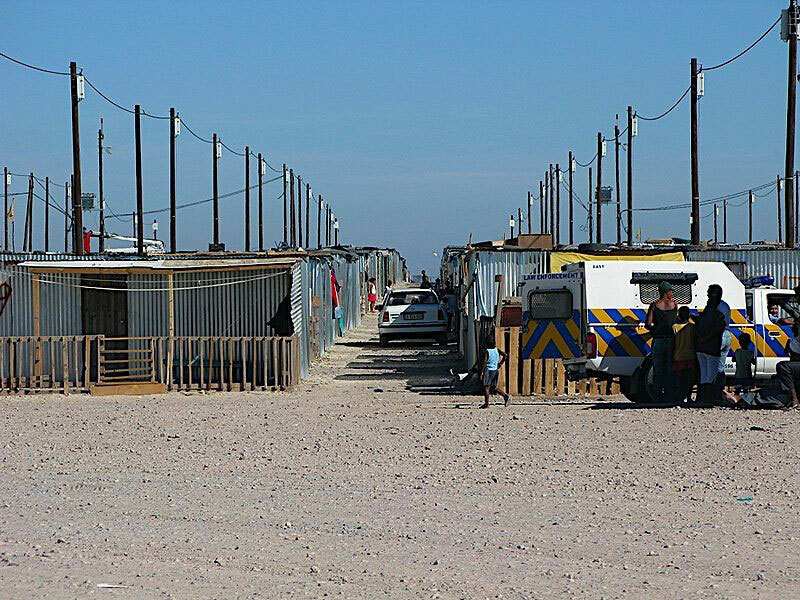 Black African and Coloured communities living in townships outside small towns and in the country in the Western Cape suffer higher levels of poverty than their urban counterparts. They also face greater issues in terms of the seasonality of employment, access to services and isolation and fragmentation in the face of often harsh and patronising relations with the world of whites. This section looks at two townships - Zolani in Ashton and Smitsville in Barrydale - and the isolated Coloured community of Suurbraak. I have really struggled to find English-language sources on these communities but having driven past them and wondered about them I wanted to represent them here - even if minimally. 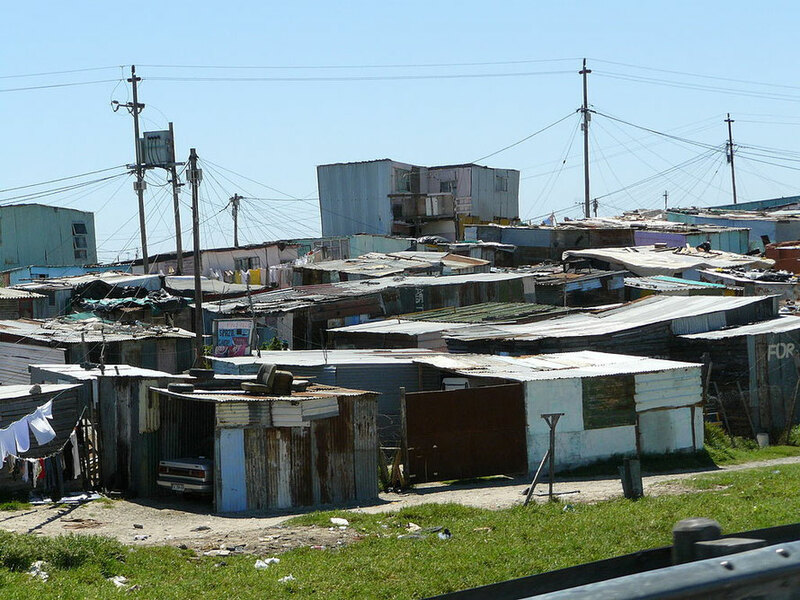 When you drive down the N2 motorway across the Cape Flats into Cape Town you pass a bewildering array of formal and informal township settlements. They seem to go on for mile after mile. And they do. They stretch from Khayelitsha and Delft in the east - some 30 or more km from the town centre - through Mitchell's Plain, Crossroads, Gugulethu, Nyanga, Langa and the many outlying subdivisions and informal settlements (226 in all) that make up the huge sprawl of townships that 'house' two million-plus people. 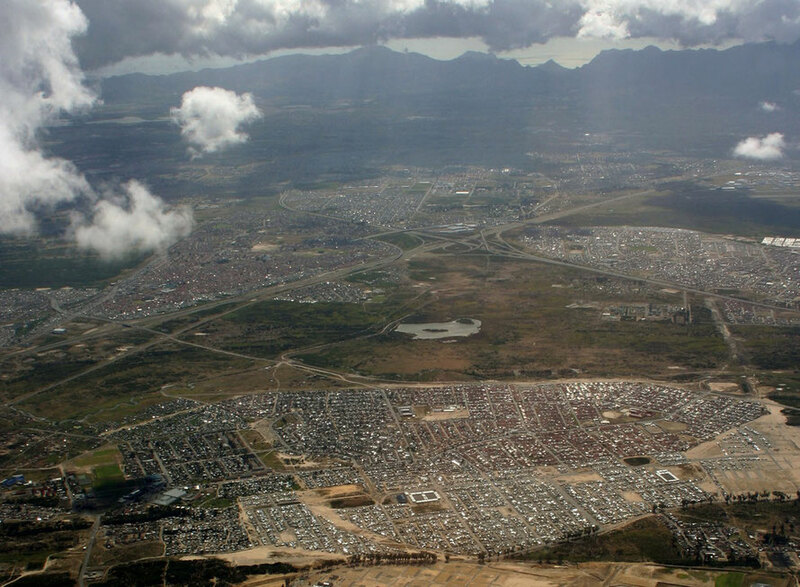 When you look at the Cape Flats with Google's satellite mapping you see a great ash-grey expanse of urban development. Zoom in and you begin to see street patterns and the monotony that the planner's pen and drafting machine have created. Row upon row of tiny houses built on the sand, punctuated by shacks built in backyards, on spare ground and into substantial informal settlements of up to 20,000 people. Here and there there is open ground but it seems never a tree. And here and there the notorious hostels built under Apartheid for 'batchelor' men herded together and separated from their families. I've tried to give a sense of the way in which the vast bleakness - at least from a speeding car - of the Cape Flats has developed over time from the first township built at Uitvlugt /Ndabeni in 1902 to the recent anti-eviction and anti-forced-relocation struggles by families at the Joe Slovo informal settlement at Langa and the pavement-dweller protest at Symphony Way in Delft. It's not an academic study and its pretty rough around the edges. But it's a start. 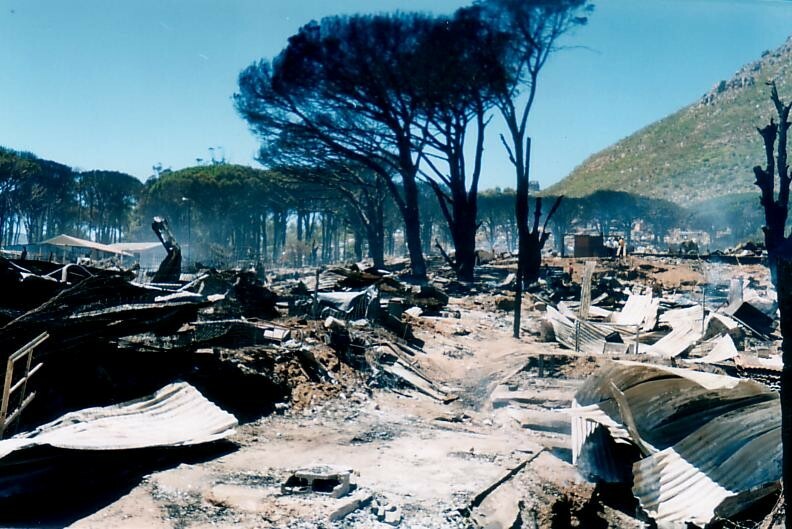 I have included two townships - Masiphumelele and Imizamo Yethu - that have grown rapidly since the end of apartheid on the Cape Peninsula amongst all that Fynbos stuff I write about elsewhere on this site. Again these were places we drove by. In my naivety I had thought the Peninsula would be all little villages, Cape Dutch architecture and sandy white (as in White) beaches. So imagine my surprise as we drove after the Chapman's Peak Drive towards Komertjie and all these black people were walking by the roadside. On the one side of the road Capri Village and on the other Masiphumelele with a population of some 38,000 people crammed into a tiny area. Again I have found it hard to find much written about these townships and have leant heavily on different NGO websites that work with these communities. There are also some great videos on the Voices from the Township page that are about them. Please also see my case study of Imizamo Yethu and Hangberg townships at Hout Bay which is nested within my Jikeleza Dance pages. Perhaps you would normally start with the material that is in the next two sections and work from the general to particular. But not here. It's more like zooming out from the particular of lived experience and particular places that have developed over specific times to a broader analysis. The Township Poverty page draws on groundbreaking work by the University of the Western Cape's Institute for Poverty, Land and Agrarian Studies (PLAAS) who actually went out and did a household survey of a sample of residents of Khayelitsha township to find out what poverty and deprivation were really like. I also came across an interesting paper by Andries du Toit, the Director of PLAAS, which makes some important points about the particular and different social landscapes of poverty in South Africa and the impact these have on individual survival strategies. Continuing the process of zooming out from the particular and specific this last brief section gives a few statistics about poverty in the Western Cape compared to South Africa and poverty differentials between rural and urban and racial groups. I have also started to compile a broader overview of the fight against poverty in South Africa in an as yet unfinshed section in the History pages currently located at Present Day Western Cape.